An altered clip from Congress chief Rahul Gandhi’s press conference has been retweeted by hundreds, including Delhi BJP chief Satish Upadhyay. 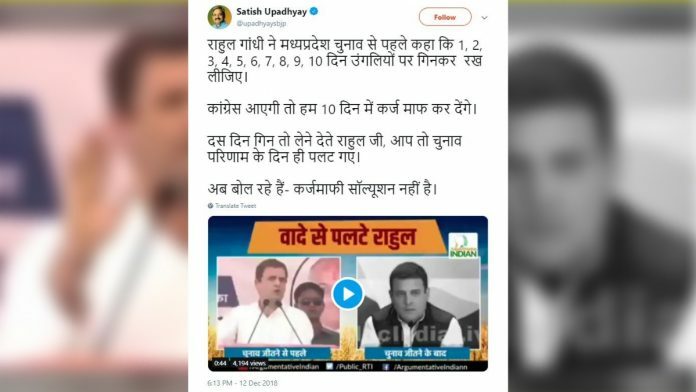 New Delhi: A collage of two videos being circulated on social media claims that Congress president Rahul Gandhi has gone back on his promise of providing loan waivers to farmers in Madhya Pradesh after winning the state election. The post, with the title “Pappu before MP election vs Pappu after MP election”, has two videos. ThePrint has found that the second clip has been altered. This part has been cut out from the altered clip. Gandhi, during the conference, went on to elaborate on the complexity of the solution, which has been strategically put in the second video. The post has been retweeted 870 times and received more than 1,100 likes. Satish Upadhyay, the Delhi BJP president, was among those who shared the post on Wednesday evening.